Select form(s) for patients to complete. Add forms from the Ocean custom form or the Ocean toolbar. You can select a form for your patient to complete by clicking on “Add Form” or “Favourite” to select from a list of your commonly-used forms (see "Configure eForm Favourites" to learn how to set up your favourite Ocean eForms). Add forms using CDS links to the Ocean Portal or direct "Add Form" CDS links. Add forms from the Ocean eForm (accessed via the shortcut on the Schedule). 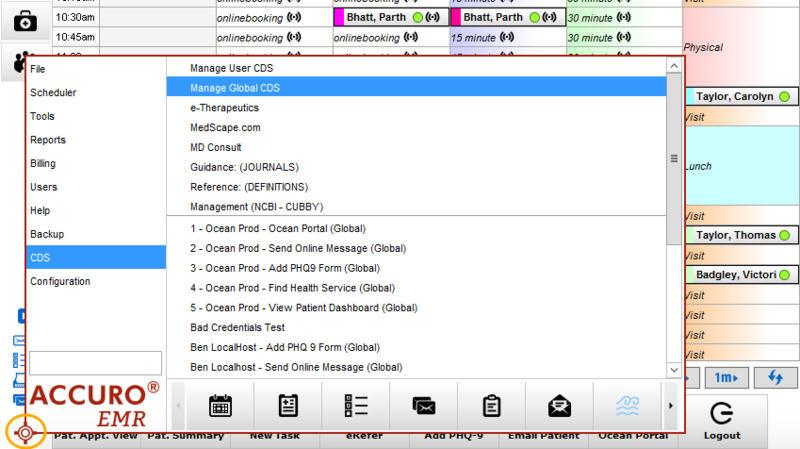 Click on the patient in the Patients tab of the Ocean Portal and select "Add eForm...". Select your patient's method of completing form(s). Find the reference number on the Ocean custom form and enter it into your Ocean Tablet. Change your tablet settings to "Kiosk" mode so that patients can access their forms by entering their health number into the Ocean Tablet, instead of the 3-or 4-digit code. Alternatively, find the reference number in the CDS link to the Ocean Portal. Find the reference number on the Ocean eForm or in the Ocean toolbar and enter it into your Ocean Tablet. Look in the Patients tab of the Ocean Portal, under the "Reference #" column, to obtain the patient's 3- or 4-digit number. This will open a message window in an internet browser, where you can edit the email body and add any secure message(s) and/or eForm(s) for the patient to complete on their home computer, tablet, or smartphone. This will open a message window, where you can edit the email body and add any secure message(s) and/or eForm(s) for the patient to complete on their home computer, tablet, or smartphone. Click the "Open" link on the Ocean toolbar or custom form. Select the "Open" link on the Ocean eForm or Ocean toolbar. Click on a patient with incomplete forms in the Patients tab of the Ocean Portal and click on the title of the form you'd like to complete. View the clinical note in your patient's chart. The Ocean-generated clinical note should automatically download into the patient's chart as an encounter note. From there, you can edit the note directly, if necessary. If any demographics information was edited these changes should be automatically reflected in the demographics fields for this patient in your EMR. Open the patient's encounter screen. There should be a "Download" button that has appeared on the Ocean Toolbar. Clicking this "Download" button will result in the the Ocean-generated clinical note being automatically downloaded into the patient's chart. From there, you can edit the note directly, if necessary. If any demographics information or mapped measurements was edited, these changes should be automatically reflected in the corresponding fields for this patient in your EMR. Review the Ocean-generated clinical note by clicking on the patient in the Patients tab of the Ocean Portal. The note will already be pre-selected, enabling convenient copy and paste of the generated note into the patient's chart in your EMR (if desired).